React: The choice to follow God isn’t something that we can just do one time and then be done with it. Right now I have a choice. I chose to follow Him. In a few hours, that choice will come up again when I am tempted to lie and boast. The choice will come up again later on when that pretty girl walks by. It is a choice I will make this evening when I chose between being diligent and responsible with my work or sitting on the couch binge watching that TV show. It is a choice you will have to make when the kids get on your nerves, or when the spouse starts nagging you. It is a choice you will have to make when your boss is channeling his inner Dom Portwood. When I am consciously and actively aware that a choice is being made, it is easy to make the right one. Even at the spur of the moment I can make the right most of the time. But always, every time? No way. It is absolutely impossible to walk through this life choosing to follow the Lord every time that choice comes up. It is a good thing I have not been called to take this walk on my own. Here’s my heart. I give it to You. Here’s my life. It is Yours. Here is my mind. Purify it and wash it clean. Let everything I have and everything I am be surrendered to Your will. But let this not just be a decision I make now in the silence of my room as I spend this moment with You. Let it be a decision I continue to make with every breath I breath and every step I take. When the frustrations and struggles and noise of this life begins to distract me, help me to chose again and again and again to follow You. This faithfulness I know I can only do through Your strength. So walk with me and carry me today, and every day until You finally come to bring me home. I have come to know that I have been in the Lord’s care from the beginning. I must stay surrendered and pray for help with self constantly. Thank you for sharing your walk of faith. We can communally pray for each of us to talk with God about our spiritual discernment and the choices we make in our lives. Great article! 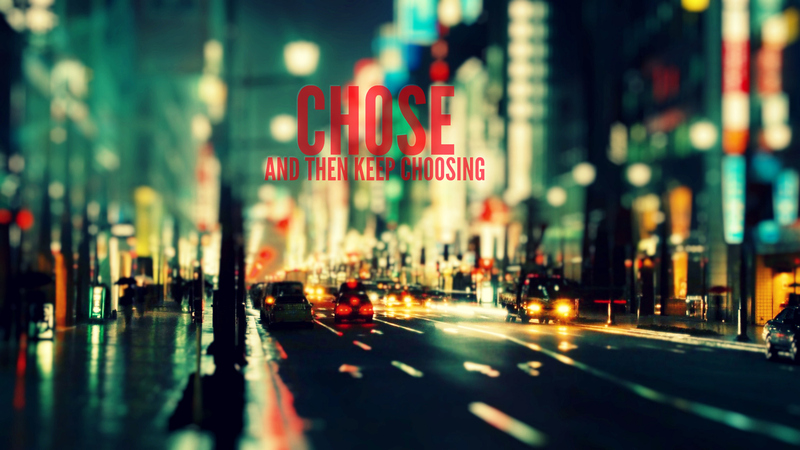 Also, title Choose and keep Choosing. . Spelling? This is why I shouldn’t be allowed to write in the morning until after I have finished my second cup of coffee. I am extremely glad I found your blog. He have answered my prayer in my tough times.